Last Friday afternoon as final prep occurred for n° 1-60 I was given the task of dusting each of the sixty wooden slices. While the roar of the vacuum consumed the space I spent a good hour contemplating each knot. Later overhead at the opening, a woman states that she saw this installation as a process of renewal, transitioning from old to new and apparently giving the tree new life. For some seeing Tree as Art Object immediately lends itself to such 'green' ideas, an obvious reminder of how sacred nature should be considered. But as lively as the party got, I personally was unable to shake the darker shadows out of my perspective. Under the dim the piece as a whole evoked a skeletal, even bodily feel. As light shone through each slab, rib-like shadows appeared on the wall and a spine fell to the floor. Tree Memorial, was my take, life and death of the Maple. There is no hint of recycling or re-purposing. Dennis presents it as it is, both polishing and disconnecting the original form. The tree itself provides its own natural documentation – the rings, which Dennis gives the viewer privy to through his meticulous cataloguing. 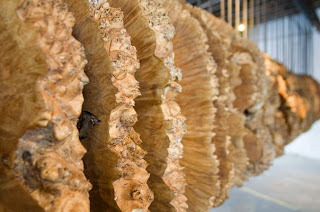 The tree becomes a presence in the room, its felled position forcing you to imagine its past height and stature. A week later the early evening light seeps into the gallery, lifting my initial somber view of the piece. n° 1-60 now hangs silently at the end of the day. As voices echo outside down Milkyway, passerbys having no idea that a few feet away a massive Maple rests. "If a tree falls in a forest, gets cut into many equal slices and is hung in a gallery, it definitely makes a sound"
This made me think of you, ET. Nice eh? the contents section of what? Lunar Launch New Years Party!